The following review appeared in the Gloucestershire Echo shortly after the 'Three Parts Guitar' gig in the Roses Theatre in Tewkesbury last September. If people could go to Three Parts Guitar concerts on the NHS, doctors would never need to prescribe anti depression drugs again. Those of us in the almost capacity audience at the Roses, Tewkesbury were treated to an uplifting and joyful celebration of wonderful guitar music played by three seasoned virtuosi. Gordon Giltrap opened the show with a clutch of tunes from his vast back catalogue, played in the inimitable style he once described himself as "fast strumming with twiddly bits in between". GG then made way for Raymond Burley, a classical player from the top drawer who delivered pieces by Bach and Villa-Lobos with impeccable precision. GG and RB have been performing together on an occasional basis for the past seven years and demonstrated how their different techniques have been moulded to complement one another. When playing solo, GG attacks a tune with Pete Townsend-like ferocity. But when RB joins him, draping delicate melodic lines over the robust foundation laid by GG's fret work, the result is softened; something like rock meets Baroque. After the interval John Etheridge took the stage for a solo set that illustrated why he is widely regarded as one of the foremost all-round players. His music career includes playing lead guitar with the freeform jazz-rock band Soft Machine, a spell with Stephane Grappelli performing the parts Django Reinhardt used to play, plus session work with everyone from Barney Kessel to Sting. JE's solo set provided a taster of these eclectic accomplishments, a high spot of the evening being his finger style rendition of the jazz standard Stormy Weather played on a Telecaster fitted with the bottom two strings from a bass guitar. The three players came together for the final section of the show, by which time the audience was so enthusiastic Raymond Burley received a round of applause for blowing his nose. Plainly the guys hadn't spent too much rehearsal time on their trio set, which simply meant it was even more fresh and inventive than it might otherwise have been. The audience enjoyed the banter between the three, the one-liners and Mr Giltrap's splendid anecdotes almost as much as the music. This was a hugely enjoyable evening of the kind for which the Roses provides the perfect venue – big enough to create atmosphere, small enough to feel at one with the performers. If you get the chance to see these guys, do it. You'll still be smiling next day. 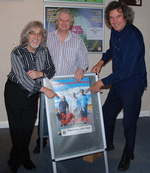 For those of us fortunate to be at the wonderful 'Three Parts Guitar' concert at the Birmingham Town Hall in 2008, news of the mini-tour with the same line-up of Ray Burley, John Etheridge and Gordon Giltrap was greeted with great pleasure. After a slightly wobbly start while the soundman quickly got his various knobs, buttons and faders properly under control, we all relaxed into an increasing sense of delight at what we were hearing. An all-too-brief solo set from Gordon was followed by every possible combination of solo, duo and trio playing. Ray was at his meticulous best with wonderfully musical interpretations of some great classical pieces; John's versatility was once again plain to hear and Gordon was clearly revelling in playing with superb musicians who are obviously all great friends. The highlight for me was the encore where my very favourite piece of Gordon's music was given the multi-layered Burley, Etheridge and Giltrap treatment. I guess my feelings can be summed up by my response to Gordon after the concert. "Was it OK?" he asked. "I'm ready now to go to heaven", I replied! If you haven't yet booked your tickets to the other two concerts for the 'Three Parts Guitar' tour I'd encourage you to do so without delay. Oh, and if you attend, make sure you keep clapping at the end - that way you'll hear the wonderful encore!